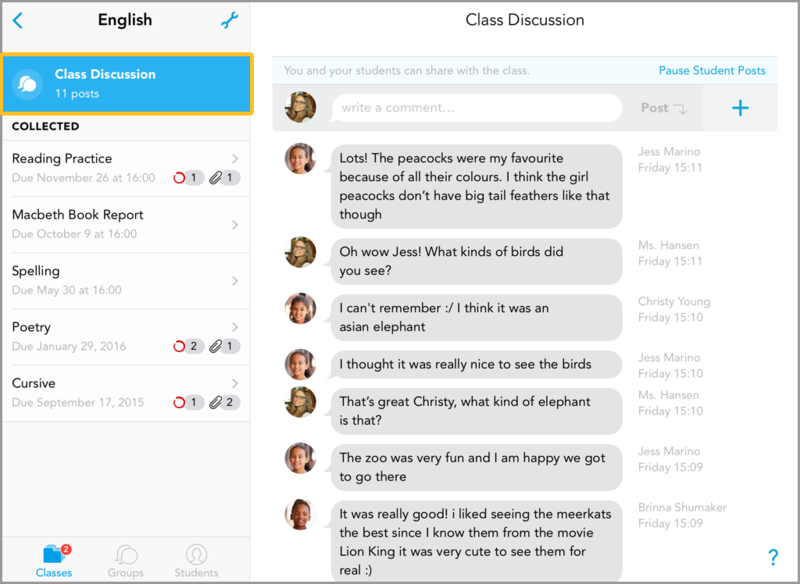 Class discussion is a place for teachers and students who share a class to discuss, share, and collaborate. When you create a class, there will automatically be a class discussion folder for you to start posting in. When pausing student posts, none of the posts will be deleted so don’t worry about losing any work by pausing posts! Teachers will always be able to post. Whether or not student posts are allowed or paused, the class discussion can be seen by all members. That said, parents won’t be able to see the class discussion. How do annotations work in class discussions? Teachers can annotate any PDF or image uploaded and students can annotate any PDF or image that they have uploaded themselves. How does the portfolio work in class discussions? It’s not possible to add files or comments from class discussions to a portfolio. To get started, you can leave a comment! Use this guide to help you out! Students will see almost the exact same things as the teachers. When student posts are paused, they will no longer have the option to upload files or comments to the class discussion.